Netanyahu said he was “honoured to be the first Israeli sitting prime minister to have an official visit to Hungary” in a joint press conference with Hungarian prime minister Viktor Orbán. 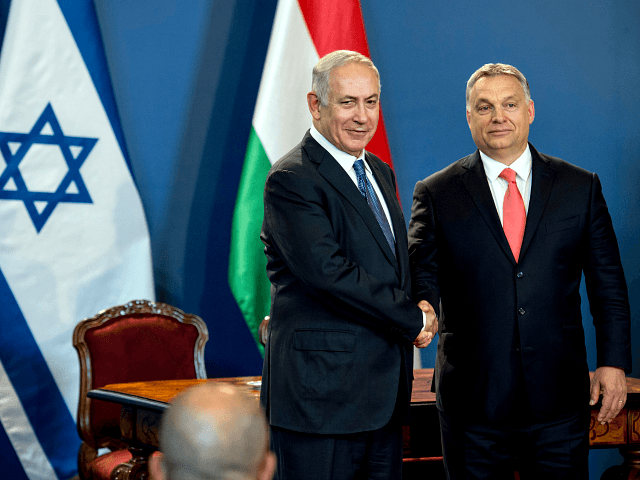 Netanyahu thanked the Hungarian leader for his “important words”, and suggested that it was now time to look towards the future rather than the past. “The Jewish people have suffered great tragedy. We’ve overcome it … and also the people of Hungary [have] faced great struggles, and you’ve overcome them,” he said. “I think there’s a great future for both of us” he added, in a speech focusing on opportunities for the countries to build cultural ties and co-operate on technology, innovation and security. Prime Minister Netanyahu was also at pains to thank Prime Minister Orbán personally for his government’s consistent support for the Jewish State on the world stage. “I also want to thank you, Prime Minister, for standing up for Israel in international forums. You have done that time and again,” he said. “We appreciate this stance not only because it’s standing with Israel, but it’s also standing with the truth,” he continued, alluding to the “new anti-Semitism that is expressed in anti-Zionism”. Critics of Prime Minister Orbán’s conservative and resolutely anti-mass migration government, including senior EU officials such as European Commission First Vice-president Frans Timmermans, have smeared the Central European country as “anti-Semitic” for speaking out against the activities of George Soros, the billionaire financier and open borders activist. The Hungarian government has repudiated these charges as “cynical and dishonest”, insisting that its quarrel with Soros centres on the fact that he is “destabilising governments in the Balkans, supporting enemies of Israel, and sending to Europe hundreds of thousands of unchecked migrants from the Middle East and Africa, some of which are home to terrorist organisations” – not his Jewish heritage. Israel’s foreign ministry released a supportive statement in relation to the accusations, noting that it is important not to “delegitimize criticism of George Soros, who continuously undermines Israel’s democratically elected governments by funding organisations that defame the Jewish state and seek to deny it the right to defend itself”.